Serbia has a new calculation for maternity leave compensation since July 2018 when a new Law providing financial support to families with children was enforced. However, mothers and the government see it differently. For the government, it is a way to prevent mothers from harming the state budget. Mothers see it as an insult as some of them receive no more than 5 EUR a month. As the new calculation method forces mothers to protest, yet the government is not convinced to change the controversial Law. The public is left confused with so many questions unanswered. 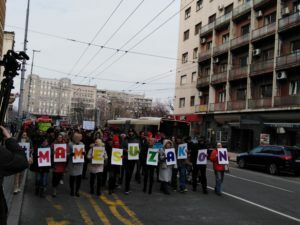 Six months after the Law was enforced, the public has no basic information on how this law works in practice – we still don’t know what is the average compensation Serbian mothers receive while on leave? Or how many families are affected by this law? As journalists, our job is to inform the public about controversial issues. The need for transparency on this important issue is what inspired our project. Journalistic textbooks teach us about two main types of sources – human and the paper ones. As we learn about the injustice from people’s experience, documents and data help us analyze the scale of the problem. When searching for data and documents, FOI requests are the main instruments journalists use. But the journalistic reality is rather different from textbook examples. BIRN journalists working on the story sent FOI requests asking for information, reports and data, but haven’t received anything so far. In order to measure the effects of the Law, the Ministry of Labour formed a Working Group for following up on the implementation of the Law in mid-October 2018. Although the Working Group produced a , the Ministry believes this is only a “working material” and “for internal use only”. Struggle with obtaining this report started with the transfer of responsibility between two ministries. Instead of giving any information, the Ministry of Labour and the Ministry in charge of Demography and Population Policy started transferring responsibility to each other – neither ministries wishing to take responsibility for the document. While the Ministry of Labour formed the Working Group, the minister in charge of Demography and Population Policy was in charge. But neither one had the authority to send the report. The Ministry of Labour because it believes it is a “, the Ministry of Demographic says it doesn’t have the report. Other Working Group members have said to BIRN that it has been agreed that only the Ministry of Labour would give information and official statements about enforcing this law. The Ministry of Labor refused to provide any interlocutor for this topic since one of the official’s public debacle. “Women are needed as workers – not as mothers,” said one of the officials from the Ministry in the live TV show. When asked to send the database on Law beneficiaries, the ministry refused again. Following this, BIRN submitted an appeal to the Commissioner for Information of Public Importance. Whilst still waiting for the response, we continue our fight for transparency. We will develop a tool which will lead mothers through the legal process and calculate their maternity leave compensation. Moreover, in order to overcome the lack of available data about the results of this problematic law, the tool will be developed in a way to record all the input. To learn more about developing the tool and cooperation between journalists and programmers, follow our next blog. By ANA CURIC, and NATALIJA JOVANOVIC. BIRN, is the Balkan Investigative Reporting Network. To learn more about BIRN visit. For stories from Balkans visit.